Milking robots are the automatic milking systems installed by dairy farms by which labor cost is reduced, quality is enhanced and yield of the milking process is increased. Milking robots optimizes the daily milking operations leading to the maximum profit obtained by dairy farms, hence leading to the growth of global milking robots market. With the implementation of these robots in the dairy industry, improved safety and quality is gained. Robotics is feasible to automate most of the complex operations that are carried out in the dairy and food processing industry. Dairy industry has been lagging behind other industrial sectors in terms of robots adoption, due to the factor that the dairy industry in most of the regions is unorganized which poses a major problem for the advancement in operations. However, there is a broad range of potential applications for robotics in dairy industry for milk and milk product production and processing. Even though robots comes up with so many advantages like safety, consistency and efficiency along with some disadvantage such as high costs involved and the requirement of skilled workforce. Goldstein Research analyst forecast the sales of milking robots to reach 4.20 thousand units by the end of the forecast period i.e. 2024. Global milking robots market is anticipated to expand at a green CAGR of 7.85% during the forecast period i.e. 2016-2024 and expected to be a billion dollar industry over the next five to six years. The report covers the present ground scenario and the future growth prospects of the milking robots market for 2016-2024 along with the raw material analysis for the robots manufacturers. We calculated the market size and revenue share on the basis of revenue generated from milking robots manufacturers across the globe. On the basis of product type, multiple stall units generated the largest market share of more than 38% in 2016 owing to high demand from dairy farms. Multiple stall units have the capacity to increase the production of milk up to three times per day. Whereas, on the other hand the market share of automated milking rotary units is growing steadily as the rotary has the capacity to milk up to 90 cows per hour. Dairy farm owners are shifting towards automation to meet the demand from the market space. However, small farm owners are still using single stall units to produce milk which is on the major factor behind the sluggish growth of single stall units market. Global milking robots market outlook 2016-2024, has been prepared based on an in-depth market analysis from industry experts. 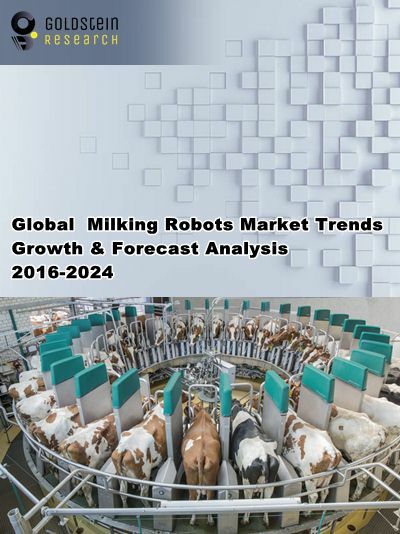 The report covers the competitive landscape and current position of major players in the global milking robots market. The report also includes porter’s five force model, SWOT analysis, company profiling, business strategies of market players and their business models. Global Milking Robots Market Report also recognizes value chain analysis to understand the cost differentiation to provide competitive advantage to the existing and new entry players. Our global Milking Robots market report comprises of the following companies as the key players: BouMatic Robotics, DeLaval, GEA, Lely, Dairy Australia and Fabdec. Other high-flying vendors in the market are: Fullwood, FutureDairy, Hokofarm, Merlin AMS, Milkwell, Milking Systems, SAC, MiRobot Trendlines and Vansun Technologies. According to the report, major driving factor for milking robots market is that it is for economic benefit i.e. it reduces the labor cost and there is no need for managing the labor. In addition, global demand for dairy products is increasing rapidly which needs to produce milk at a higher rate. Dairy product manufacturers are adopting milking robots to take the productivity to an extent to gain more profit in business. Further, the report states the major challenge is the high cost of robots. Huge one time investment for various players is a big challenge to set up the whole infrastructure. Moreover, low availability and lack of skilled labor to operate milking robots are the key restraint which creates cynicism among the industry players. Based on geography, North America dominated the global milking robots market with the market share of 42.5% in 2016 on the back of expansion of dairy and food processing industry. Dairy industry in the United States is growing rapidly with an annual growth rate of 2.8% over the past few years. Globally, more than 30,000 autonomous milking robots have been sold in various geographies. United States is picking up the pace in the adoption of milking robots. As the dairy industry is becoming more competitive in the global market place, dairy product manufacturers are also inclining towards robotics and automation to sustain the growth in the growing business environment. What is the revenue of Milking Robots in 2015-16 and what would be the expected demand over the forecast period?